Sunday July 28th 1901 It was cooler this morning and I read some after the morning work was done. I slept most of the afternoon. It rained a little more. 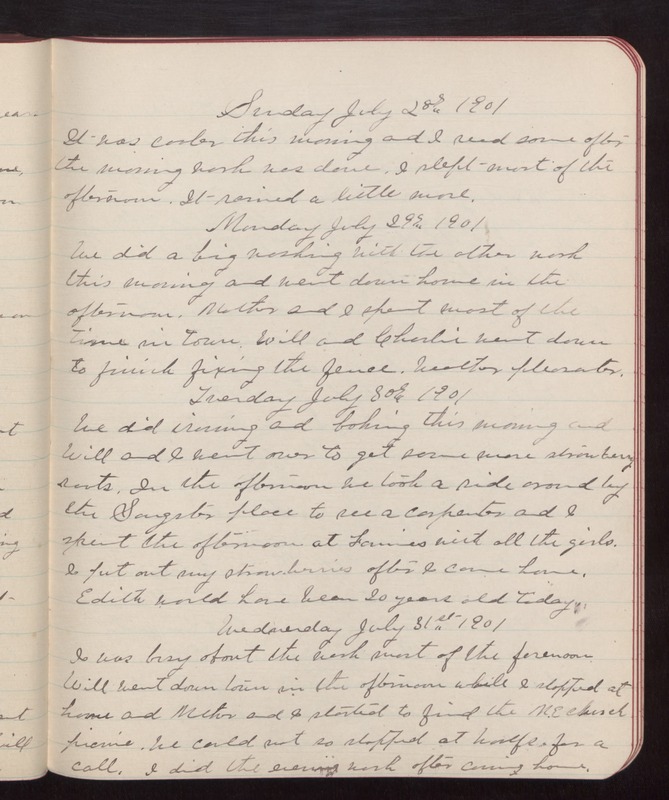 Monday July 29th 1901 We did a big washing with the other work this morning and went down home in the afternoon. Mother and I spent most of the time in town. Will and Charlie went down to finish fixing the fence. Weather pleasanter. Tuesday July 30th 1901 We did ironing and baking this morning and Will and I went over to get some more strawberry roots. In the afternoon we took a ride around by the Sangster place to see a carpenter and I spent the afternoon at Fannies with all the girls. I put out my strawberries after I came home. Edith would have been twenty years old today. Wednesday July 31st 1901 I was busy about the work most of the forenoon Will went down town in the afternoon while I stopped at home and Mother and I started to find the M.E Church picnic. We could not so stopped at Woolfs for a call. I did the evening work after coming home.